I politely told him that it was a bit different than that (in the usual robust and Anglo-Saxon way that young men do). The job did entail doing a lot of “rock-hard sums” as I was arguing about multi-dimensional scaling and logarithmic regression models with the British Dental Association’s advisor. He was the president of the Royal Statistical Society and very kindly tolerated dealing with a young upstart 22-year-old me. I am sure he could have demolished me quickly in any debate – yet we agreed on a lot and he was supportive. Looking back, this was an early lesson for me in power and how to use it. I was reminded of that this week. I have been asked about the day-to-day role of a Trust Chief Executive by Alex, a graduate trainee who was shadowing me, and a front-line colleague at the curry club. “So what do you actually do each day?”. Be accountable to the chair and to the board of directors directly. All members of the management structure report either directly or indirectly, to the Chief Executive. Be responsible for proposing and developing the trust’s strategy and overall objectives. Implement the decisions of the board of directors and its committees. Provide information and support to the board of directors and council of governors and ensure that board of directors’ decisions are implemented. Facilitate and support effective joint working between the board of directors and council of governors. Provide input to the board of directors’ agenda from themselves and other members of the executive team. Ensure the chair is aware of the important issues facing the trust and propose agendas which reflect these. Ensure that the executive team provides reports to the board of directors which contain accurate, timely and clear information. Ensure that they and the executive team comply with the board of directors’ approved governance procedures. Ensure that the chair is alerted to forthcoming complex, contentious or sensitive issues affecting the trust. Provide input on appropriate changes to the schedule of matters reserved to the board of directors and committee terms of reference. Support the chair in their tasks of facilitating effective contributions and sustaining constructive relations between executive and non-executive members of the board of directors, elected and appointed members of the council of governors and between the board of directors and the council of governors. Provide information and advice on succession planning to the chair, the nominations and remuneration committee, and other members of the board of directors, particularly in respect of executive directors. If so appointed by the board of directors, serve on any committee. Lead the communication programme with members and stakeholders. Contribute to induction programmes for new directors and ensure that appropriate management time is made available for the process. Ensure that the development needs of the executive directors and other senior management reporting to him/her are identified and met. Ensure the provision of appropriate development, training and information. Ensure that performance reviews are carried out at least once a year for each of the executive directors. Provide input to the wider board of directors and council of governors evaluation process. Promote and conduct the affairs of the trust with the highest standards of integrity, probity and corporate governance. Ensure the provision of effective information and communication systems. Lead the delivery of good and effective partnerships, agreeing with the Chair the appropriate lead on key stakeholders. This is a big list – and each of them covers a broad scope. For example – “Run the Trust’s business”, “lead the delivery of good and effective partnerships” and “promote and conduct the affairs of the trust with the highest standards of integrity, probity and corporate governance” each have depth and breadth. In practice you can get a good sense of what this means through looking at the CEO Diary Blogs of people like Jonathan Fagge of NHS Norwich Clinical Commissioning Group and Dr Mark Newbold of Heart of England NHS Foundation Trust. Difficult choices, public accountability and a focus on leadership, strategy and delivery are highlighted in every one of these. It is clear that, whether you run a commissioning or a provider organisation, these are system and organisation roles….and both Mark and Jonathan present examples of excellent leadership in both. So this is helpful at explaining about what a CEO does in the NHS. And as a former statistician, I would say it is all “necessary but not sufficient”. I would add two really important additions for emphasis. 1. Be accountable – for two things only. 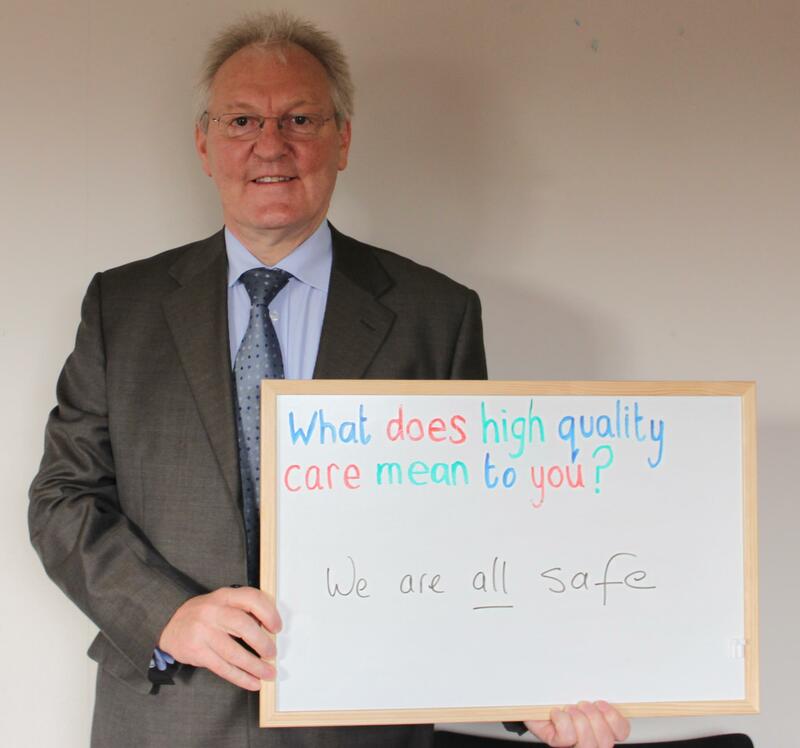 The safety of every patient we care for and the value of every penny we spend. By “Value” I mean impact, quality, effectiveness and value for money. As the Chief Executive I carry this accountability 24 hours a day, seven days a week. It is like a coat that I never take off and one I wear gladly when the culture and systems are right and one that can feel incredibly heavy if they are not. 2. Create the culture where others can succeed. This is one where people feel able to take responsibility and use the authority that they have been given to act. I have written about this elsewhere (“Some things are just too heavy for Superman to lift”) and will not repeat myself here. So what does a Chief Executive do all day? Everything required in the list of bullets above and, more importantly, balances keeping the accountability while ceding authority to others. It is never easy – I often get it wrong – but it is an essential part of everything we do, each and every day. Three million people volunteer in hospitals each year according to the Kings Fund study…..and even better. Innovative forms of volunteering are reaching out to new communities and engaging people in service delivery in new ways. And this is just the hospital figure. In the UK – according to the Institute for Volunteering Research, 44% of people volunteered in 2012/13 and 29% of people did so at least monthly. What a resource – imagine if it were harnessed, what could we achieve? In an era where the NHS has to change, the role of volunteers can go even further than the range of brilliant befriending schemes, luncheon clubs and digital inclusion classes we see about the City. Volunteers as members and Governors of NHS Foundation Trusts could fundamentally help to reshape the NHS and social care. 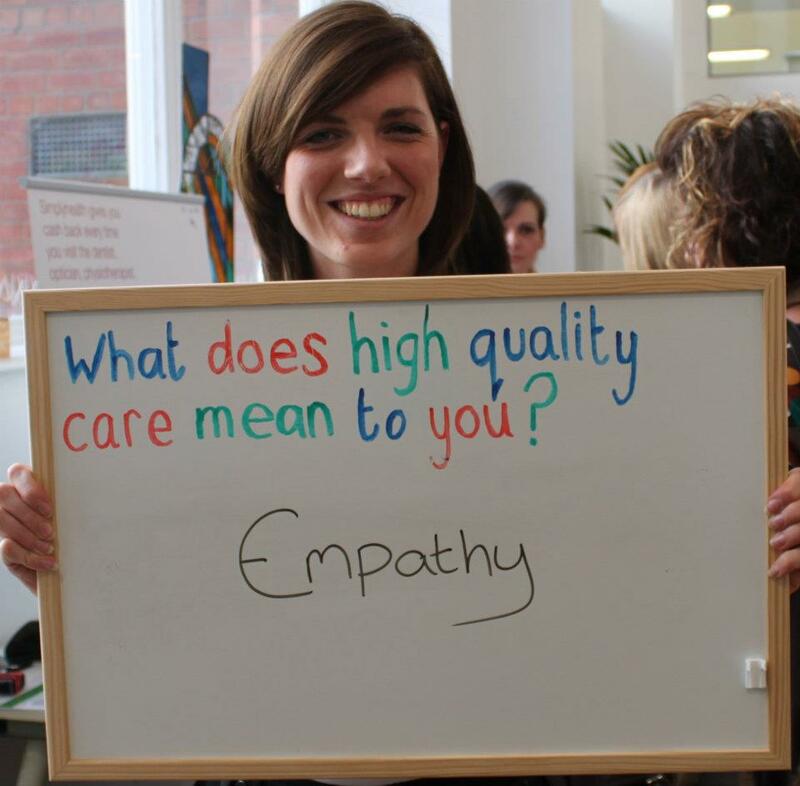 staff were recruited for values by the people who they were to treat and support. Older ladies interviewing district nurses to see if they care. School children interviewing community paediatricians to test their rapport. General managers explaining their role to sceptical citizens in advance of appointment. groups of volunteers were able to look at the environments in which care was provided in the trust of which they were members, unaccompanied and trained to look out for issues, as well as using their judgement of the space as people. In doing so, they would make sure that they were “Safe and Clean”. Service changes were driven by staff and public members in a team testing what should change and how. A real focus on purpose and outcomes drove these changes too, with social value at the heart of reform. 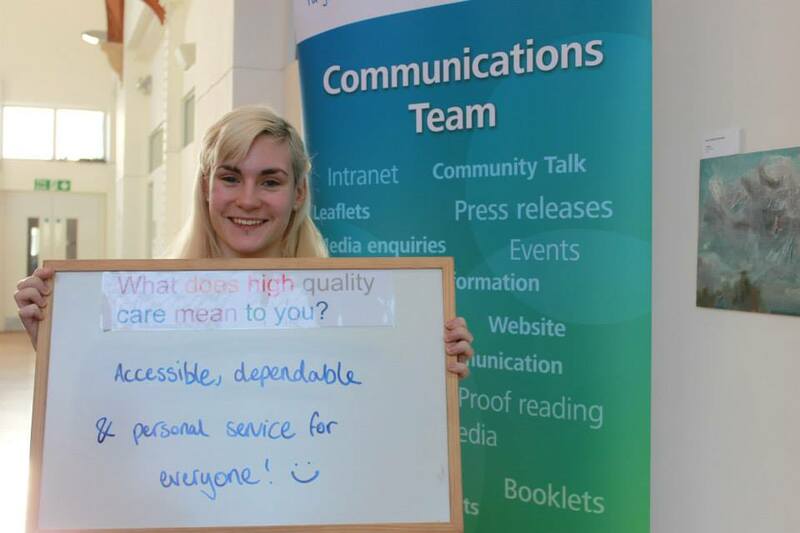 New communications material was tested by members to see if it was accessible and readable and free from health jargon and polite, with reader groups of everyone from adults with a learning disability to older people and teens. This is the world we are building in Leeds Community Healthcare NHS Trust. All of the above is happening through our 10,000 members….and it could not be more real. This was brought home to me at “The Event” this week – our two-day showcase of change, innovation, research and progress……at The Event, we had members showcasing their work; members asking the searching questions of the speakers; members pushing for change; members volunteering to get involved in the next big set of changes. I looked up from my position on the stage at an audience of staff and public members and felt that something had genuinely changed. This is at the heart of our Integration Pioneer as well as our future as an NHS Trust. We want to work with the assets that exist within patients, carers, families and communities to deliver a sustainable future for the NHS….and real change is beginning to happen as a result. 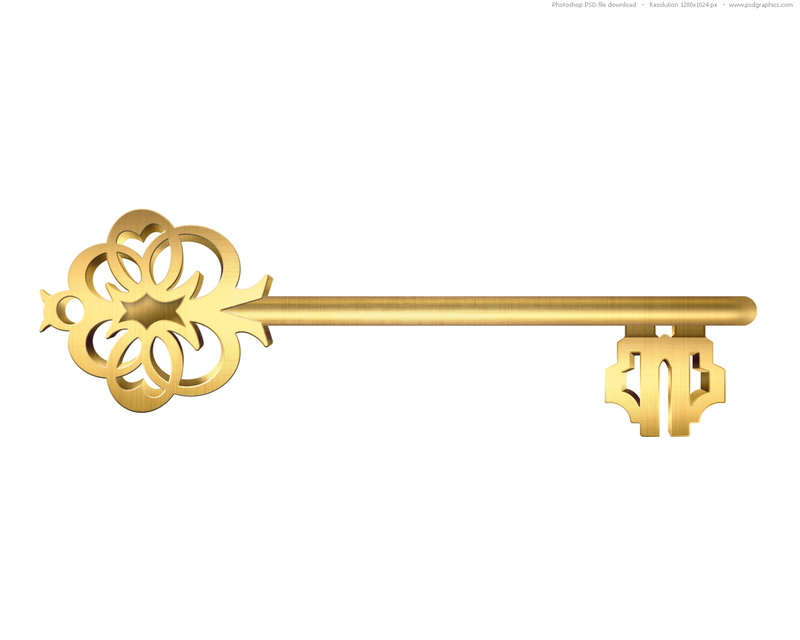 I blogged about this here and Elsie’s Golden Key. If you are reading this and thinking that I am delusional or overly positive about the role of volunteers in the service of the future, the challenge I would put back is that people tend to be more intelligent, resilient, creative, reasonable and often brilliant than you could imagine. If you need some proof, look at the work on the skills of public health volunteers published by the excellent Professor Jane South at Leeds Metropolitan University – example here. Or you could just give it a go. Because “Patient Leadership” is a big part of your future, my future and the future of the NHS. As the NHS Constitution famously starts….”The NHS Belongs to the People”…. There are many potential Cinderellas in the NHS – each unheralded or put upon service will hear the claim routinely. Mental Health Services, rehabilitation, renal support, learning disabilities have all staked a claim. I was going to suggest, looking at the definition, that NHS Community Services are “ignored and treated as less important than other people or things” and therefore fit the bill. 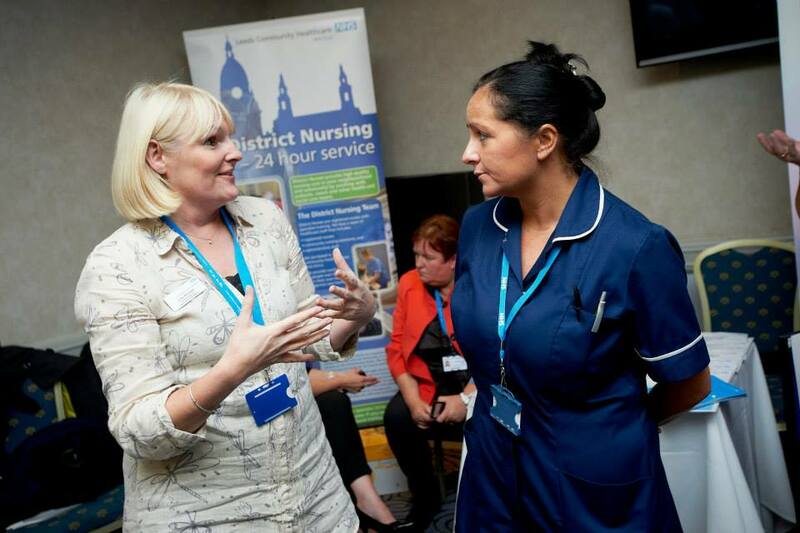 It is rare for a politician or senior NHS Leader to talk about a community matron, podiatrist, dietician, family support worker, health visitor or school nurse. 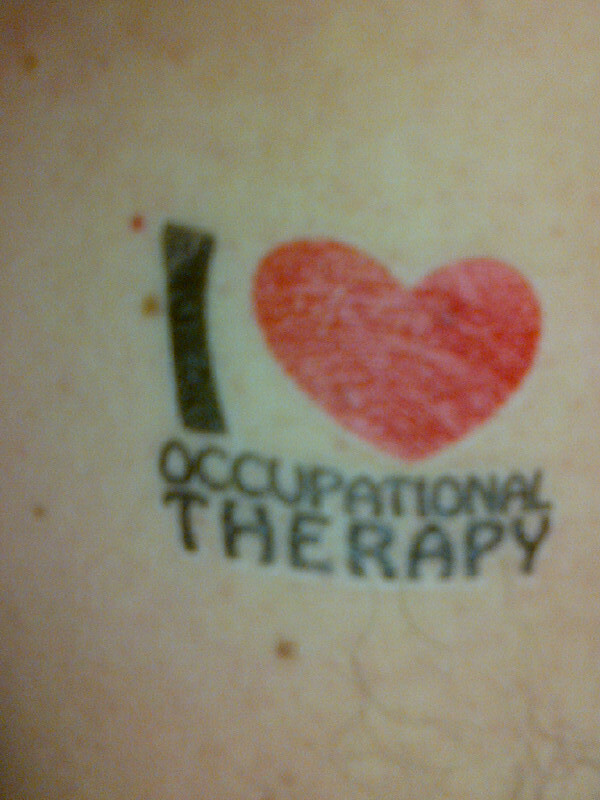 Most would struggle to tell you what an Occupational Therapist does – like all our staff they are just brilliant. And show me the policy documents that trumpet the role NHS community services will play in the future system – one tailor-made for them. Michael Scott wrote about this here. I have also written about this here. The policy documents don’t exist and the scale and role of community services is not understood. But……. 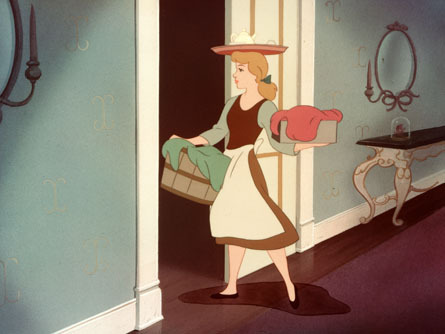 So maybe it is time to rethink the idea of cinderella services. Because if 2 million contacts are part of the Leeds Landscape, then I reckon maybe 100 million contacts take place in NHS community services like ours in England. That dwarfs activity in hospitals. And every contact will be working with people to help them with something they believe is important – their lives. Ignored and unimportant? No. And then we need to think about Cinderella herself. Wasn’t she the one with all the talent, resourcefulness and ingenuity? So if being a Cinderella service means being cherished and valued by the people you serve and having the skill and talent to succeed in the toughest of climates, then I am proud to be running a Cinderella Service. One that, with my colleagues across the country, tries to pull off 100 million piece of magic each year. lives of people needing care in their own homes. People in our services see how we really live in modern Britain. Behind closed doors, little miracles are happening every day, lives are being changed or people are persisting with conditions that lead to lives many find beyond comprehension. This is the world my staff inhabit. Populated by all sectors of society – we treat everyone everywhere. Stoical women living with Parkinson’s , the epitome of Yorkshire grit. Young mums with palliative babies, seeing through short lives to the full. Teenage girls not letting cerebral palsy get in their way. Refugees, the victims of torture and trafficking. Aged singers reminiscing about life before COPD and reliving mixed race marriages in 1950s Leeds. Young dads, doting on precious bundles, eyes like saucers. The rich, the poor and everyone in between. From head to toe and birth to death. I try to spend at least one whole day a month back to the floor and often manage more. Every one of these sessions leaves me with an indelible memory of the people I meet. It often leaves me emotionally drained and carrying a set of concerns about them too. On the back of yesterday’s session with our fantastic Parkinson’s Nurse Specialist, Paddy Harris, I feel exactly the same. That lead me to thinking about our staff and the weight they carry of all those lives. Every day working close to life, death, joy and many people with persistent, ongoing struggles. How do they cope? Some tell me the love of the job and the difference it makes drives their energy levels. Others say, after a challenging visit, they readjust in the car before the next one. Regular exercise, the support of teams, recognition from senior colleagues, a card from a grateful family. Small touches making a lasting difference…..
Our staff need to be supported to flourish in this reality. Michael West’s work shows how much this matters. Do read his blogs. helped him through tough times as a carer for his mum. 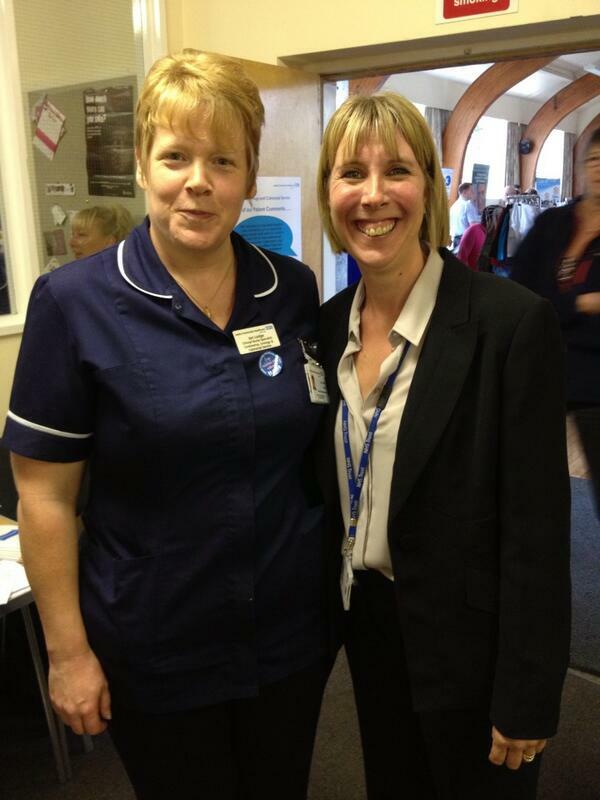 That nurse’s compassionate approach is something we need all our staff to be able to deliver. I have seen this from band 3 support workers and band 8 community matrons and staff in between (as well as drivers, therapists, doctors…) Retaining this valuable asset requires that we look after our staff. The RCN survey into stress among nurses is a sign we need to do more. If two thirds have considered resigning, then things need to change. 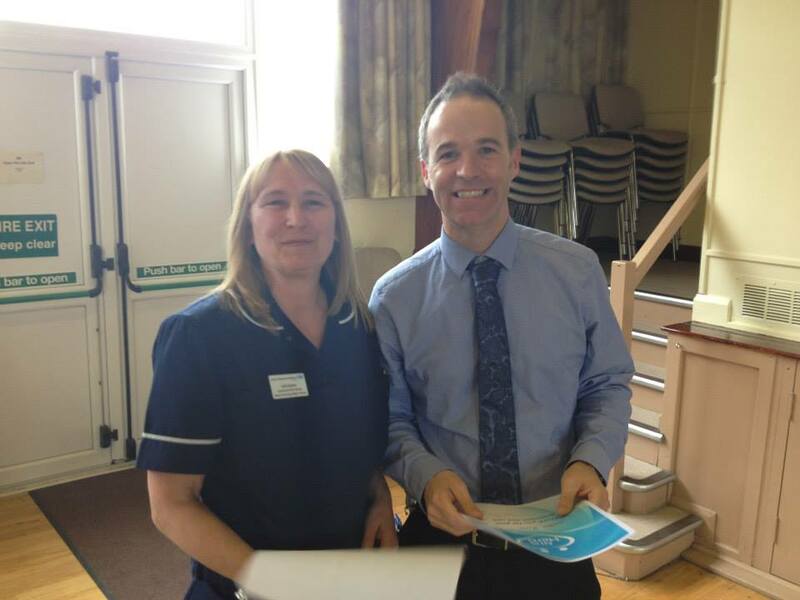 In my organisation, as well as back to the floor sessions, I have just finished listening events with community nurses. These have been a necessary part of how we are growing and changing services. In the news we hear about A&E being busy. This is the same for my 24-7 community nursing and therapy services. A boost of over 35 extra nurses in the next month – with support from commissioners – is essential. Nurses tell me of the strain they are under whilst new capacity comes on stream. At each session they have noted the importance of knowing that I know what they face, that the chair and other directors too. Just being there to listen helps… …and I now, more than ever, appreciate that this impacts on the resilience they need to do one of the most fulfilling and important jobs in the world. So next time you casually tell someone that nurses or staff in the NHS don’t care, ask yourself when you last spent time with one and what you might be doing instead that will support them to do what they do best. Let’s lead with a positive culture that promotes little miracles of kindness, compassion and care. “Last week I mentioned the “leading from every seat” sessions (based on the art of brilliance) that have now been attended by around 900 staff. These sessions have been organised by staff for staff. 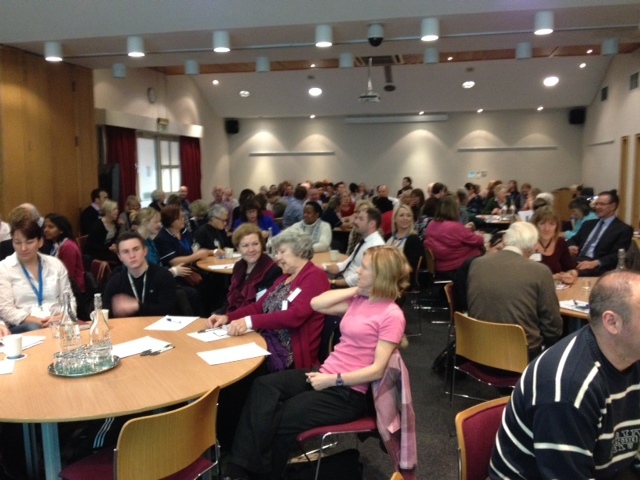 I overheard one of the team from the Community Intermediate Care Unit discussing the sessions yesterday – “It isn’t like anything I was expecting – it was great”. My reflection on why the sessions are so powerful is that they reconnect us with our purpose and our values. In the trust, we spent a lot of time creating a vision and a set of values that reflect what we do. For this week’s blog, I could talk about the tough Programme Management Board on cost improvement; the positive and challenging Business Committee meeting; commercial developments; pressures and hotspots in some services; our Foundation Trust progress; partnership and relationships with senior people; national developments; quality measures and safety. These are clearly a feature of my week. You can read about these in the Board papers which are available to view here. Benita Powrie, Head of Service for Children’s Occupational Therapy and Physiotherapy, arranging for one of her patients A to do her work experience with the trust. Then spending time being interviewed by A, who showed Cerebral Palsy was no barrier to her great questions and thoughtful approach, passion and understanding. The fact she has agreed to work on our Youth Council is a bonus. Seeing the work that Emma Dickens and the membership team have done covered in a guest editorial for NHS Managers.Net [http://www.nhsmanagers.net/guest-editorials/involving-members-in-staff-recruitment/] because it is such great work! Of course my day was full of other stuff as well – incredibly challenging and difficult stuff too. Reconnecting with purpose; being inspired by the difference we make and the people I work with is what keeps me focused and energised. I don’t need to look far to be inspired as we face the challenges of each day. Forget the Janitor at NASA, Andy makes people better…. What’s the best thing that has happened to you this week? You should try it, in your teams, at least once a month. The answers will reconnect you with purpose, energise you and remind you of the impact you have every day. And the best thing that has happened to me this week? Was an answer to that first question. One of our HR team was my neighbour. 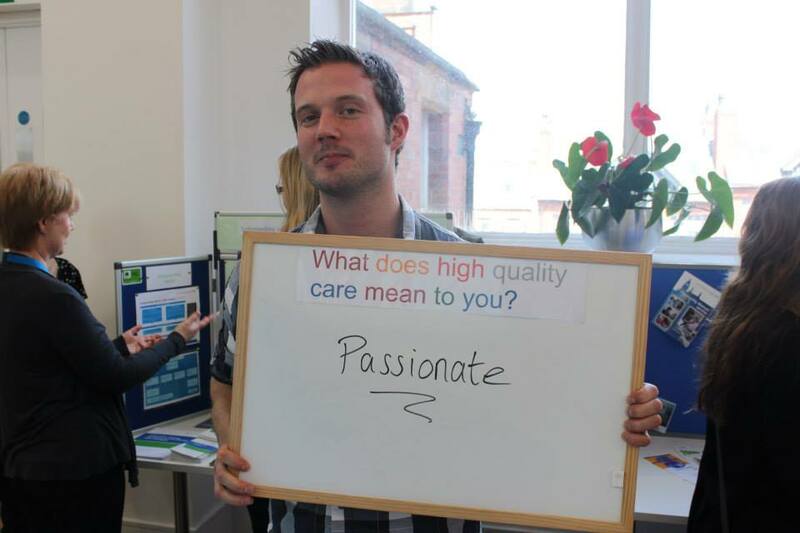 Andy – why do you do your job? So it not only “janitors at NASA who put men on the moon”. We call it Leading from Every Seat. More on that in my next blog – because we have it. In spades. I am not asking for the moon……. Back in the early part of the noughties, I was a senior civil servant. We had a big debate about where we should focus policy after putting huge increases in staff and funding into the NHS. The answer? “Quality”. 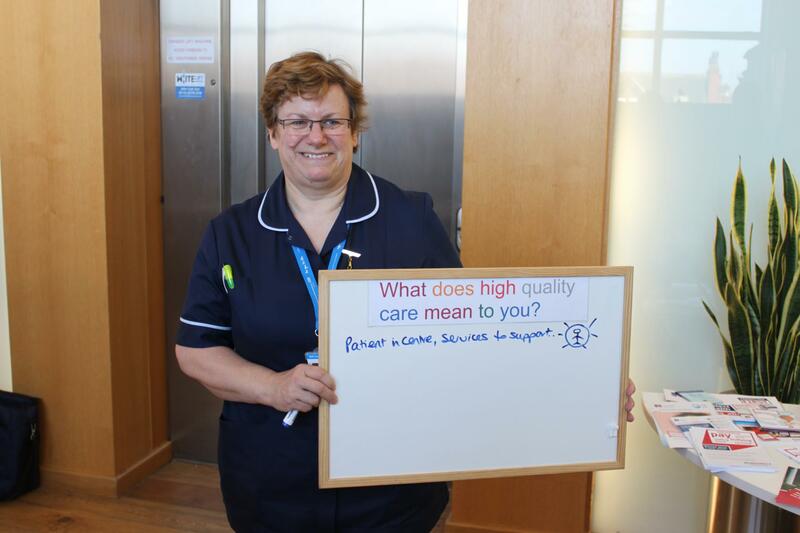 We have been improving quality, in broad terms, since – through National Service Frameworks, Cancer Improving Outcomes Guidance, higher satisfaction…. 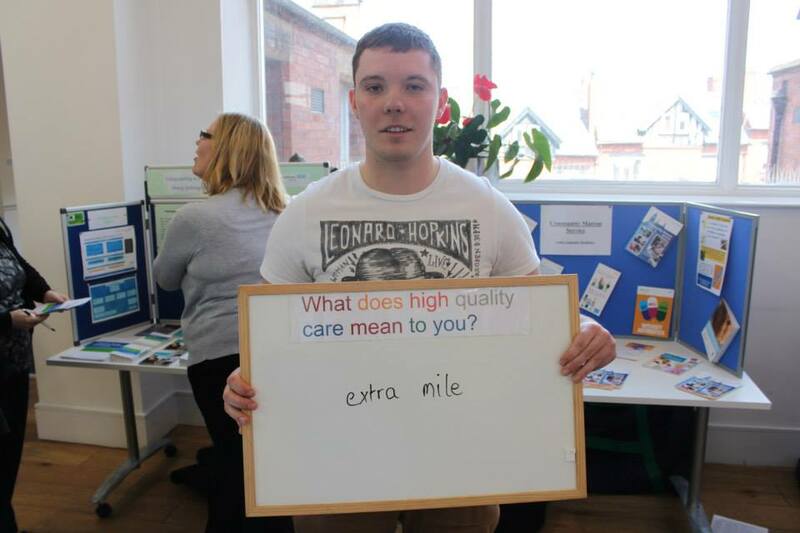 “What does high quality care mean to you” It is a question we ask every new starter at LCH NHS Trust. You can see some of the answers in our gallery here or watch a video here. It’s a question that the NHS England Consultation on the future of services “The NHS Belongs to the People” a call to action, needs to ask…..and we need to listen carefully to the answer. It’s a question that we need to get right, and get the right people to ask too. 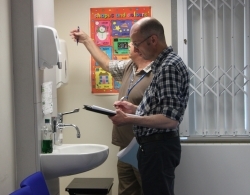 Last week, our trust members interviewed consultant paediatricians. Junior staff members, parents and children interviewing doctors and having a real say in their appointment. The world has changed! We have done the same with senior managers and consultants in rehab too.Our members are also engaged in driving quality through assessments of care environments, service improvement programmes and communication tests. Every one of them has something to offer and a view on quality. Want to join them? You can become a member here. What does high quality mean to me? Well, I expect well trained staff, working in a team, supported by the best clinical evidence base in the world. Better IT and more convenience would be nice. kindness too. A recognition that I have a life and services are a guest in it. Above all, I want to be seen as an asset, not a disease or an issue. Because I reckon the NHS will need me to look after myself much more in the future…..and everyone else too. In an era of austerity, we should keep that focus. Because quality can be better, simpler and more cost effective. ……and if we engage people in the question, and delivering the services that result from the answer, we will have a chance of succeeding. That I hope will be one of the conclusions of the NHS England Consultation. A quick bonus – here is my favourite short video of the last year. It is all about quality. 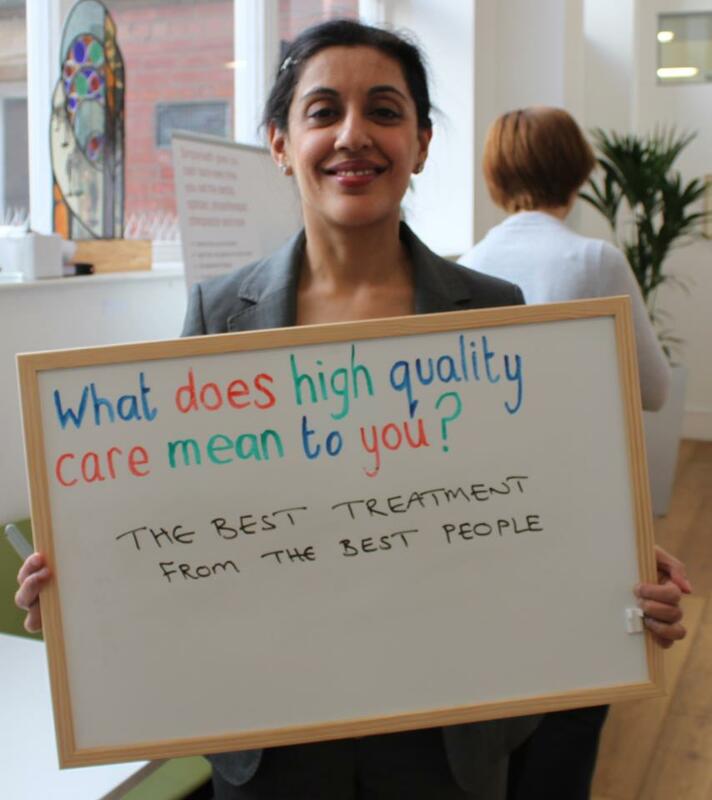 What’s the best thing about your care? “Being able to shave my own legs.” Fabulous words from Vicky in praise of Suzanne Henshall and the OT team. “I had been given a ring with 15 keys on it. But no-one told me which key opened which door. Or what was behind the doors.” It was frustrating and difficult. Then about a year ago services were integrated in one of our demonstrator sites. She said “Suddenly I was given a golden key. It opened any door and gave me what I needed”. Over the last two years, I have been writing about the risk of competition and fragmentation of commissioning on care. As part of a Future Forum submission, in briefings for the NHS Confederation, everywhere I could, I have worried about multiple providers serving multiple commissioners for a single patient journey leading to duplication and gaps. There has been a lot of change since. Those risks are receding. Every day we hear about the importance of integrated services in the future NHS. The Government delivers a welcome £3.8bn pooled fund for integrated health and social care in the budget. Norman Lamb announced a number of “pioneers” to look at integrated health and social care systems – Leeds has submitted its bid along with, some say, around 100 others. Mark Britnell from KPMG – touted as future CEO of NHS England by the commentariat – writing in this month’s Health Services Manager says “Integration trumps competition in terms of delivering sustainable benefits”. Monitor sets out its thoughts on enabling integrated cares in its role as system regulator. The fabulous National Voices have come up with a new definition – at the heart of the vision in Leeds. The integration lobby have won the argument, it seems. So why worry? Nana will get her golden key won’t she? Perhaps. John Appleby writes in this blog about the role of the OFT and Monitor in ensuring appropriate competition. 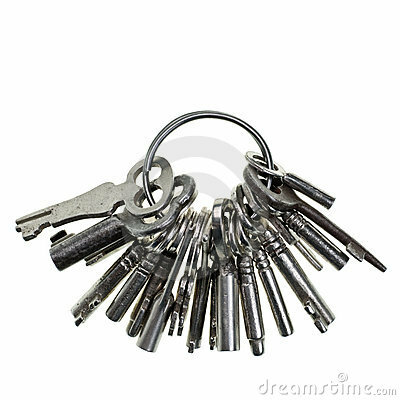 He argues well about the need to make a good case for not competing – with more than a golden key as support. The financial system still supports the delivery of funds to hospitals for activity or part funds urgent care to their detriment, depending on your view. Many agree it doesn’t yet support integrated care or continuity or shifts in care – good King’s Fund Report here. Which leaves local leadership to sort things out. I have no problem with this. We must have faith in local System Leadership, which is essential in these circumstances. 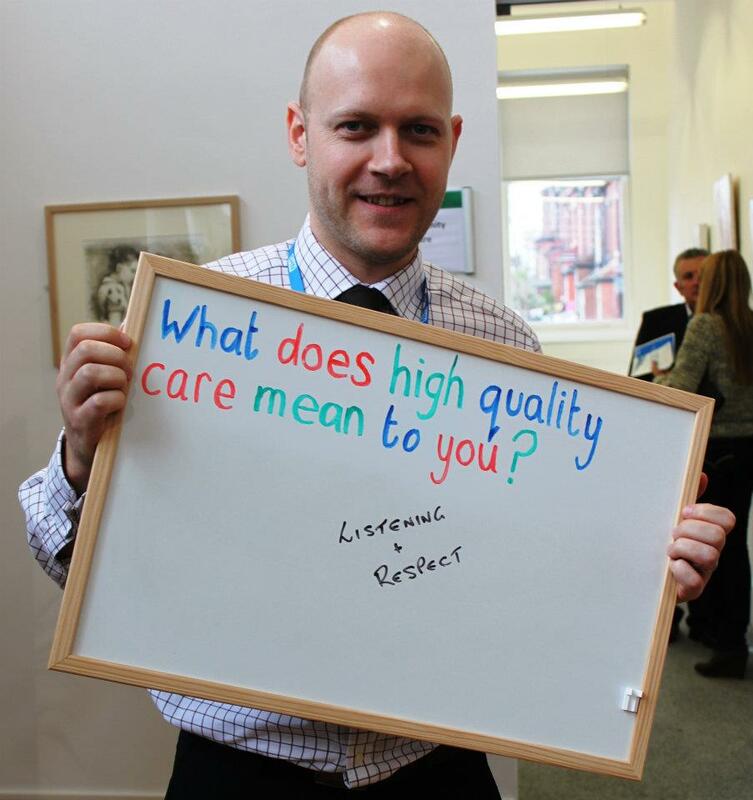 In Leeds we are working really hard to ensure that everyone plays a system leadership role. Our Health and Social Care Transformation Board helps to drive this. Its role in the integration of services has been fundamental to the progress to date. Local politicians have backed change. Commissioners have used the non-recurrent resources to fund change. Providers have thought about services first, not structures. Researchers have been working with us to assess the impact on quality and activity. Lots of detail here. And change is beginning to happen. Beautiful, impactful, essential change. Change that happens in homes so is not visible enough. Change that transforms lives. Not enough yet to give every Nana a golden key but sufficient to be seen by those who matter. Take Elsie Sykes, one of our patients, talking about being “lifted” in the video on this page. If you have watched this, you will understand why we must succeed. Because we all know an Elsie and we all have a Nana, don’t we?